5 Reasons You’re Not Losing Weight — And How To Change That! Considering two out of three adults are either overweight or obese in the U.S., losing weight is probably one of the most challenging things Americans face. So, why can’t we lose weight? 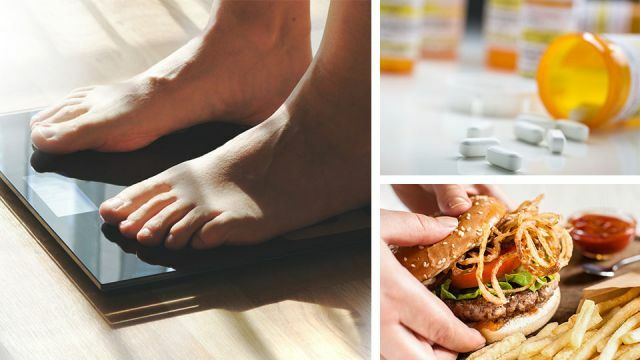 While there’s no simple answer to that, there are several common behavioral and medical reasons why losing weight is so darn hard. Let’s explore reasons why you’re not losing weight and what being overweight ultimately does to your body. What stopping you from losing weight? Only half of all overweight and obese adults report they are trying to lose weight, suggests a recent study in the Journal of the American Medical Association. One reason: the longer someone lives with obesity, the less likely they’ll make an attempt to lose weight. Particularly, if they had attempted weight loss multiple times without success. The problem is, while most people believe they’re doing everything right, sometimes there are other factors at play. You politely declined dessert, stuck to small portions, and, in fact, barely ate enough to sustain a small child. Yet, you still managed to gain a pound. Could it be that you actually consumed more calories than you thought? People often eat more calories a day than they realize. And, total calories are what matters when it comes to weight loss. Sometimes, people forget about the little things they munch on between meals can significantly interfere with weight loss. Create a food diary and track your calorie intake on a smartphone app. Research suggests that apps used to track calorie intake may help boost weight loss. On average, a woman needs to eat about 2,000 calories per day to maintain her weight, according to Healthline. And to lose one pound per week, 1,500 calories per day. An average man needs 2,500 calories to maintain his weight and 2,000 to lose one pound per week. But just cutting calories randomly, without taking into account the foods you eat is not a good way to lose weight. Most likely you’ll just end up hungry and compensate by overeating. So, stick to a well-balanced diet filled with clean whole foods and lean protein. And, of course, watch your portions. There may be a connection between sleep duration and weight gain, according to the Mayo Clinic. In fact, it’s not just too little sleep but also too much sleep that can place you at risk of gaining weight. Sleeping less than five hours a night, or more than nine hours a night, seems to increase your chance of weight gain. Experts believe that oversleeping effects hormones that regulate hunger and perhaps stimulates the appetite. On the other hand, lack of sleep can lead to fatigue and therefore results in less physical activity. The solution is to get seven to nine hours of sleep each night to function at your best. Of course, children and teens need even more. An underactive thyroid is often associated with some weight gain. Although weight gain is often greater in people with more severe cases of hypothyroidism. The cause of the weight gain is complex suggests the American Thyroid Association. Extra weight gained is normally due to excess accumulation of salt and water. However, trying to lose weight with untreated hypothyroidism can be difficult. When properly treated you can expect to lose about 10 percent of your body weight. You’ve mindfully stuck to your diet all week. But the weekend is fast approaching, which means you’ll be heading out for drinks and late night fast food. For you, dieting means treating yourself on the weekend and opting for a far-less structured approach. But by Monday — you swear— you’ll be right back on track. Well, by the time Monday rolls around, you’ve gained back the weight you’ve so diligently lost the week before. Three days of relaxed eating can easily erase four days of focused effort. While no one is perfect, and you do need a treat once in a while, relaxing your eating every weekend is a diet no-no. If you must have dessert on the weekend, go for a healthier meal and skip the wine. If you must have wine and garlic mashed potatoes, skip dessert. Planning whole days or weekends around cheating will only put you on the weight loss roller coaster. Some people only consider how excess weight will make them look and feel. So, their goal for losing weight is simply to fit into those new jeans or travel more comfortably in coach. But in truth, being overweight has a dangerous side. If you have a large belly and waist, then you’re likely storing dangerous visceral fat. But, even if you’re less than noticeably overweight you can still have visceral fat. If your diet regularly consists of too many carbohydrates, artificial sweeteners, processed sugar and processed foods, you could be carrying around visceral fat and not even know it. The good news is, you can rid yourself of visceral fat and it doesn’t require willpower. Rather, you simply need to make healthy changes. For instance, reduce sugary foods and refined carbs from your diet. Eat more non-starchy veggies and protein. If you’re not exercising, start. Even if that means walking 30 minutes a day. Learn to manage your stress. Finally, get a good night’s sleep! Before you know it, you’ll not only rid yourself of dangerous visceral fat but also that hard-to-lose excess weight in the process. Hey Buddy!, I found this information for you: "5 Reasons You’re Not Losing Weight — And How To Change That!". Here is the website link: https://www.thealternativedaily.com/5-reasons-youre-not-losing-weight. Thank you.